With their ergonomic and functional design, "Wippy System" wash brushes feature special bristles that won't leave their mark. 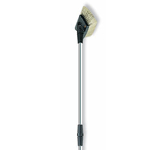 The Wippy System brushes are ideal for all cleaning operations out in the open air; washing the war, cleaning the garden furniture, curtains etc. A flow control valve built on the handle of the brush guarantees optimum use, without wasting water. The bristles are of top quality synthetic material remove dirt efficiently without scratching surfaces. The shampoo sticks are 100% soluable and biodegradeable.